"Solar Flux Recordings" is a site-specific installation conceived for the Palacio de Cristal, which involves architecture and landscape in a performative piece activated and conducted by the sun. Under the sweeping glass ceiling of the glass palace nine sculptural groups are displayed, condensing the airy space, each of them composed of elements taken from the architectural vocabulary of the Palacio. 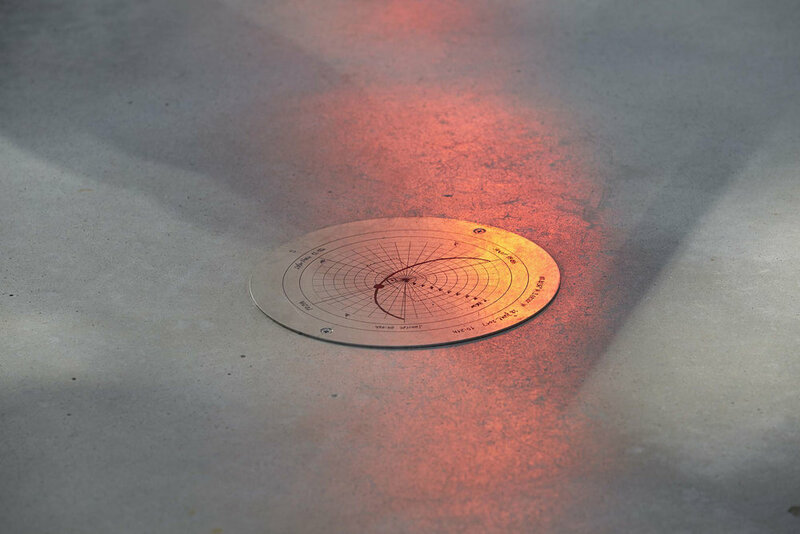 These spatial drawings made of slight metal lines and colored glass fields are reflected on the pavement through two-dimensional pictures in constant transformation, projected and animated by the sun. Beyond the cinematographic flow of succeeding and overlaying images each group refers to a specific position of the sun, which has been reached only once during the exhibition period: represented by the specific orientation of the inclined glass panels and designated by a metal plaque on the floor, the sculptures have become recordings of this performative event. The work, which is a system and its diagram, returns us to the world we inhabit, and underlines the bonds, which link us to the environment and its technologies.